Is twenty minutes too far to drive for a loaf of bread? Not when that bread is an Egyptian loaf from Wild Flour Bread in Freestone, freshly baked in their brick oven and loaded with bits of fig, pear, and ginger. Pair that with a nice hot latte spiked with cardamom for a delicious start to your day! We make regular visits to this friendly bakery on the Bohemian Highway and we aren’t alone. There is always a steady flow of customers, rain or shine. Watch the bakers work their magic while you commune with others at the big table, or head outside and enjoy the lovely garden and orchard. 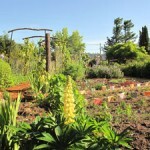 This time of year is especially nice because their garden is in bloom, bursting with flowers, herbs, veggies, and berries. It makes for a pleasant stroll, coffee in one hand, chocolate-hazelnut biscotti in the other. Pay a visit to the white miniature horse that wishfully pokes his nose through the fence or linger in an Adirondack chair and soak up some sun. There is no hurry. 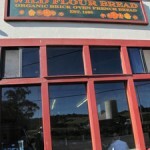 Wild Flour makes tasty traditional loaves of whole wheat and French bread, or so I am told. I’ve honestly never tried them because I am always seduced by the exotic fusion of flavors in their other breads. The olive bread is a hearty loaf with nigella seeds and zaatar. The Bohemian features apricot, orange and pecans. 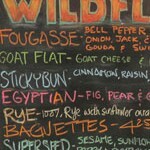 And, you have never met a sticky bun like a Wild Flour sticky bun. It is huge, more of a loaf than a bun, and lives up to every bit of its “sticky” title. And, if you’re in the mood for something a bit smaller, you can’t go wrong with an apple, white chocolate and pecan scone. 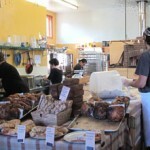 This bakery, in and of itself, is a worthy destination but is also an easy detour when you’re headed to the coast or touring the back roads of west Sonoma county. Just make sure you go on a Friday, Saturday, Sunday or Monday (8:30am to 6:00pm). The rest of the week they are closed!